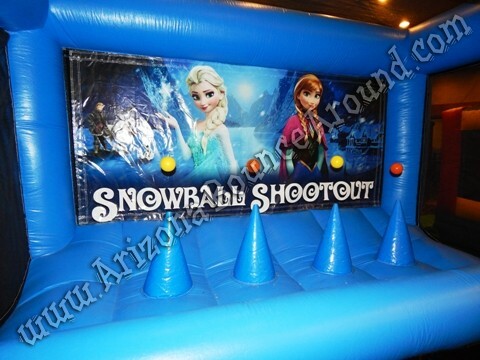 Our snowball Shootout Game is a brand new indoor or outdoor snowball throwing game featuring an inflatable frame, floating targets and a Frozen themed backdrop. This game was designed as a holiday party game but it’s also good for year round entertainment for kids and adults. Our Snowball Shootout game is good, safe, old-fashioned fun for the entire family. 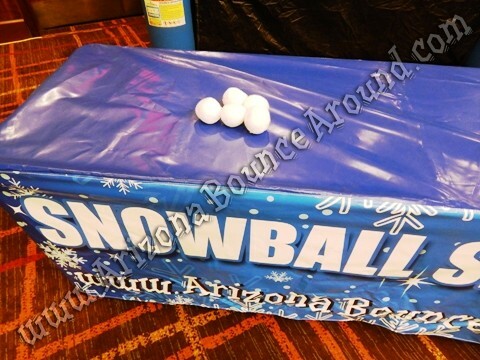 Our snow ball game comes with 10 snowballs, 10 floating balls (only 4 can be used at a time) Inflatable frame and covered 8’ table. We can also supply bow and soft tip arrows to use this game as an archery game. You will get 2 bows, 8 soft tip arrows and 10 snow balls at no adtional cost as part of a holiday package. Be sure to add our penguin ring toss game for a great holiday game package. 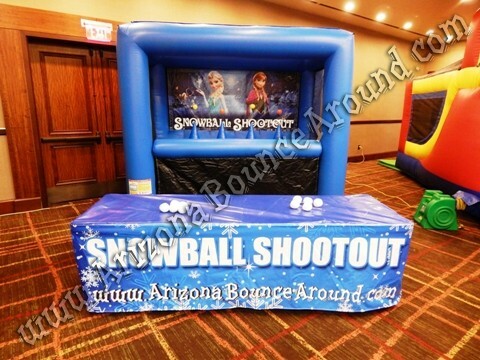 Our Snowball Shootout Game is perfect for office parties, corporate events, school carnivals, birthday parties and more. Kids, tweens, teens and adults will all love this game. 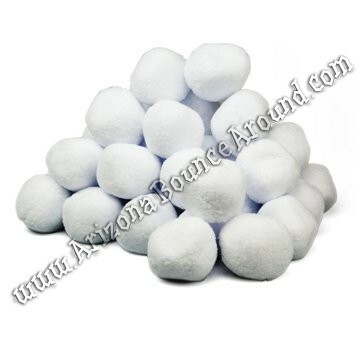 Our soft snowballs are approximately 3" in diameter and very soft but heavy enough to throw. Customer Kara B. says "At Thanksgiving we had the best snowball fight ever with this game. The entire family (30+) got involved for over an hour straight of fun, laughter and exercise. Yes we got a work out just throwing snowballs.